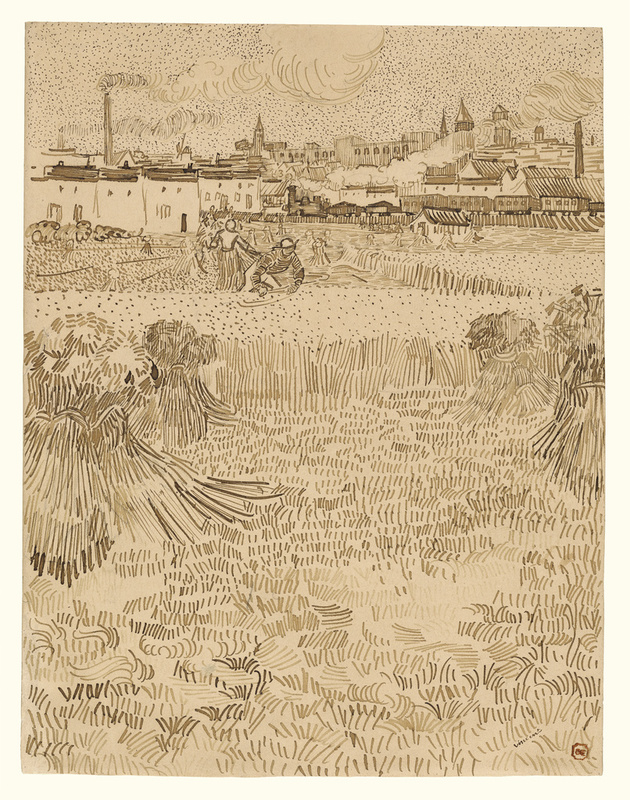 Vincent van Gogh made this drawing in varied hues of golden brown ink as a study of a painting. The vertical composition, whereby forms grow smaller and denser as the eye moves up, leads the eye across the stubble of a newly cut wheat field framed by gathered stacks of wheat. In the center, a man scythes a section of the field while a woman bundles cut wheat under her arm. The background shifts to the cityscape of Arles, where churches and densely packed houses stretch across the horizon. A railroad train and factories churning smoke into the sky signal the dawn of the machine world and its effect on traditional ways of life. This drawing embodies many of the characteristic features of van Gogh's work: remarkably varied graphic strokes, a subject matter that comments on the human condition, a golden glow that suggests the warm light of southern France, and a balanced yet dynamic composition. Theo van Gogh, Dutch, 1857 - 1891, sent by the artist in a letter dated August 8, 1888. At his death, by inheritance to his wife, Jo van Gogh-Bonger, 1891. Johanna van Gogh-Bonger, Dutch, 1862 - 1925, sold to Paul Cassirer, 1907. Paul Cassirer, German, 1871 - 1926 (Berlin, Germany), sold to Gustav Engelbrecht, 1907. Gustav Engelbrecht, born 1848 (Hamburg, Germany), sold to Julius Freund, 1928. Julius Freund, German, 1869 - 1941, probably sold to Robert von Hirsch. Thomas Gibson Fine Art, Ltd.
Catalogus der tentoonstelling van schilderijen en teekeningen door Vincent van Gogh, exh. cat. (Amsterdam: Stedelijk Museum, 1905), p. 38, no. 374. Vincent van Gogh: 30 Marz 1853-29 Juli 1890: zehnte Austellung, exh. cat. (Berlin: Paul Cassirer, 1914), unpaginated, no. 87a. Vincent van Gogh: erste grosse Ausstellung seiner Zeichnungen und Aquerelle, exh. cat. (Berlin: Otto Wacker, 1927), unpaginated, no. 70. Faille, J.-B. de la. L'Oeuvre de Vincent van Gogh: Catalogue raisonné. 4 vols. (Paris and Brussels: Les Éditions G. van Oest, 1928), vol. 3, no. F1492. Faille, J.-B. de la. L'Oeuvre de Vincent van Gogh: Catalogue raisonné. 4 vols. (Paris and Brussels: Les Éditions G. van Oest, 1928), vol. 4, plate CCXII. Vincent van Gogh, facsimiles from his drawings and watercolours (Munich: Hans con Marees-Gesellschaft, 1928), plate XI. Kunstwerke des neunzehnten Jahrhunderts aus Basler Privatbesitz, exh. cat. (Basel: Kunsthalle, with Holbein Verlag, 1944), p. 87, no. 50, ill.
Zwei Ausstellungen aus Privatbesitz in der Schweiz: Meisterwerke Holländischer Malerei -- 25 Werke von Vincent van Gogh, exh. cat. (Basel: Galerie M. Schulthess, with K. Werner, 1945), p. 24, no. 31. Vincent van Gogh, 1853-1890, exh. cat. (Basel: Kunsthalle Basel, 1947), p. 36, no. 161. Gogh, Vincent van. The Complete Letters of Vincent van Gogh. 3 vols. (London: Thames and Hudson, 1958), vol. 3, pp. 3-6, no. 519. Gogh, Vincent van. The Complete Letters of Vincent van Gogh. 3 vols. (London: Thames and Hudson, 1958), vol. 2, pp. 584-597 (letter 498). Faille, J.-B. de la. The Works of Vincent van Gogh: His Paintings and Drawings (Amsterdam: Meulenhoff International, 1970), p. 520, no. F1492. Lecaldano, Paolo. L'opera pittorica completa di Van Gogh e i suoi nessi grafici. Vol. 2, Da Arles a Auvers (Milan: Rizzoli, 1971), pp. 212-213, no. 565c. Hulsker, Jan. The Complete Van Hogh: Paintings, Drawings, Sketches (Oxford: Phaidon, 1977), pp. 346, 354, no. 1544, ill.
Hulsker, Jan. Van Gogh en zijn weg: al zijn tekeningen en schilderijen in hun samenhang en ontwikkeling (Amsterdam: Meulenhoff International, 1977), pp. 346, 354, no. 1544, ill.
Sotheby Parke Bernet and Co., London. The Robert von Hirsch Collection: Impressionist and Modern Art. June 26-27, 1978, vol. 4, pp. 179-180, lot 843, ill.
Walker, John A. Van Gogh studies: five critical essays (London: JAW Publications, 1981), p. 35, no. 40, ill.
Thomson, Belinda. The post-impressionists. (Oxford: Phaidon, 1983), pp. 160-2, no.161, ill.
Pickvance, Ronald. Van Gogh in Arles, exh. cat. (New York: The Metropolitan Museum of Art, with Harry N. Abrams, 1984), pp. 100, 146, cat. no. 82. Bonafoux, Pascal. Van Gogh: le soleil en face (Paris: Gallimard, 1987), p. 82, ill.
Thomas Gibson Fine Art, Ltd, London. 19th & 20th Century Masters and Selected Old Masters, June-July 1987, pp. 46-47, ill.
Feilchenfeldt, Walter. Vincent van Gogh and Paul Cassirer, Berlin:The Reception of van Gogh in Germany from 1901-1914 (Zwolle: Waanders, 1988), p. 135, no. F1492, ill.
Erpel, Fritz. Vincent van Gogh: Die Rohrfederzeichnungen (Munich: Schirmer/Mosel 1990), p. 170, no. 87, ill.
Wolk, J. van der and Ronald Pickvance. Vincent van Gogh. 2 vols. (Milan: A. Mondadori arte 1990), vol. 1, p. 233. Faille, J.-B. de la. Vincent van Gogh: The Complete Works on Paper: catalogue raisonné. 2 vols. (San Francisco: Alan Wofsy Fine Arts, 1992), vol. 1, p. 148, no. 1492. Faille, J.-B. de la. Vincent van Gogh: The Complete Works on Paper: catalogue raisonné. 2 vols. (San Francisco: Alan Wofsy Fine Arts, 1992), vol. 2, plate CCLVII. Walther, Ingo F., and Rainer Metzger. Vincent van Gogh: The Complete Paintings. Michael Hulse, trans. 2 vols. (Cologne: Benedikt Taschen, 1993), vol. 2, pp. 400-401. Kendall, Richard. Van Gogh to Picasso. The Berggruen Collection at The National Gallery, exh. cat. (London: National Gallery, 1994), pp. 38-39, no. 2, ill.
Hulsker, Jan. The New Complete Van Gogh: Paintings, Drawings, Sketches (Amsterdam and Philadelphia: John Benjamins, 1996), pp. 346, 354, no. 1544. Schuster, Peter Klaus. Picasso und seine Zeit: die Sammlung Berggruen, exh. cat. (Berlin: Staatliche Museen zu Berlin, with Ars Nicolai, 1996), pp. 34-35, 304, no. 2, ill.
Van Gogh: Felder, exh. cat. (Bremen: Kunsthalle Bremen, with Hatje Cantz, 2002), pp. 128-129, cat. no. 42, ill.
Heugten, Sjraar van. Van Gogh Draughtsman: The Masterpieces, exh. cat. (Amsterdam: Van Gogh Museum, 2005), pp. 131, 137, fig. 121. Ives, Colta, et. al. Vincent van Gogh: The Drawings, exh. cat. (New Haven: The Metropolitan Museum of Art, with Yale University Press, 2005), pp. 212-213, 268, 276, cat. no. 72, fig. 208. Kosinski, Dorothy. Van Gogh's Sheaves of Wheat, exh. cat. (Dallas: Dallas Musem of Art, with Yale University Press, 2007), pp. 35, 116, cat. no. 27, ill.
Kopp, Edouard. Capturing Nature's Beauty: Three Centuries of French Landscapes, exh. cat. (Los Angeles: J. Paul Getty Museum, 2009), unpaginated, pl. 41. Gogh, Vincent van. Vincent van Gogh: The Letters. The Complete Illustrated and Annotated Edition. Leo Jansen, Hans Luijten, and Nienke Bakker, eds. 6 vols. (London: Thames & Hudson, 2009), vol. 3, pp. 3-6 (letter 519). Benson, Timothy O., ed. Expressionism in Germany and France: From Van Gogh to Kandinsky, exh. cat. (Los Angeles: Los Angeles County Museum of Art, with DelMonico Books, 2014), pp. 105, 279, ill.